It’s no secret that my SH-G350 laser machine, a.k.a. 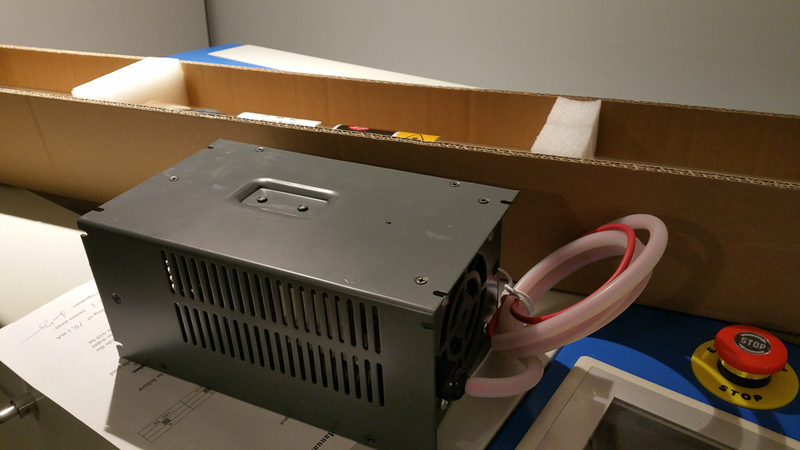 50W eBay laser cutter, is not really a 50W. Yup, it’s one of the biggest scam on the eBay. What you get is actually a machine with 35-40W watt 800mm long CO2 tube, that’s being overridden with higher current to work like 50W. A while back I purchased a cheapest laser power meter I could find: Mahoney Co2/YAG 100W power meter probe. 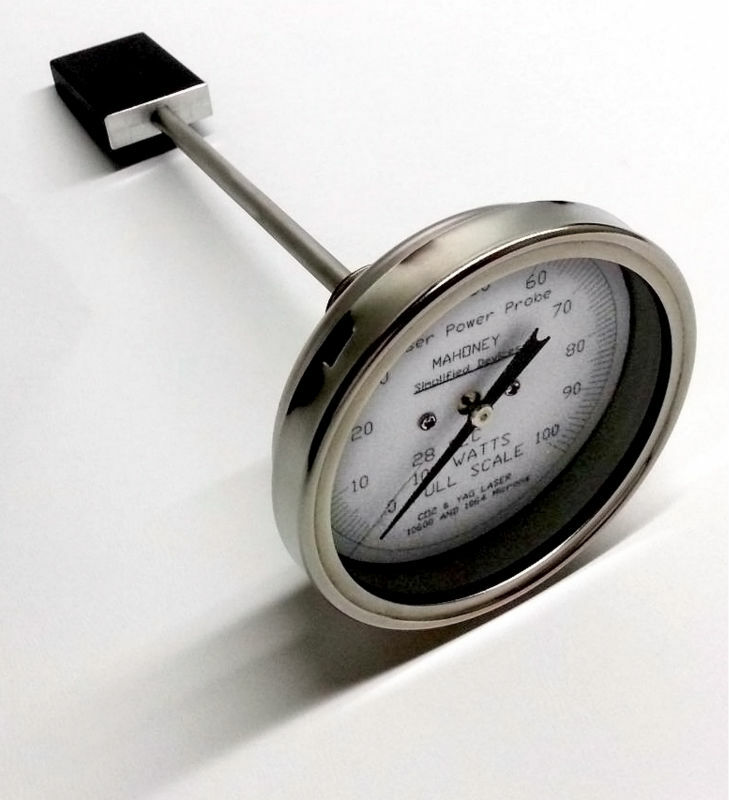 Thing looks like an oven thermometer, and it actually is a thermometer of sorts. It measures by how much laser beam heats up the probe, which expands a spring inside, which moves gauge needle. But hey, it works and works well. 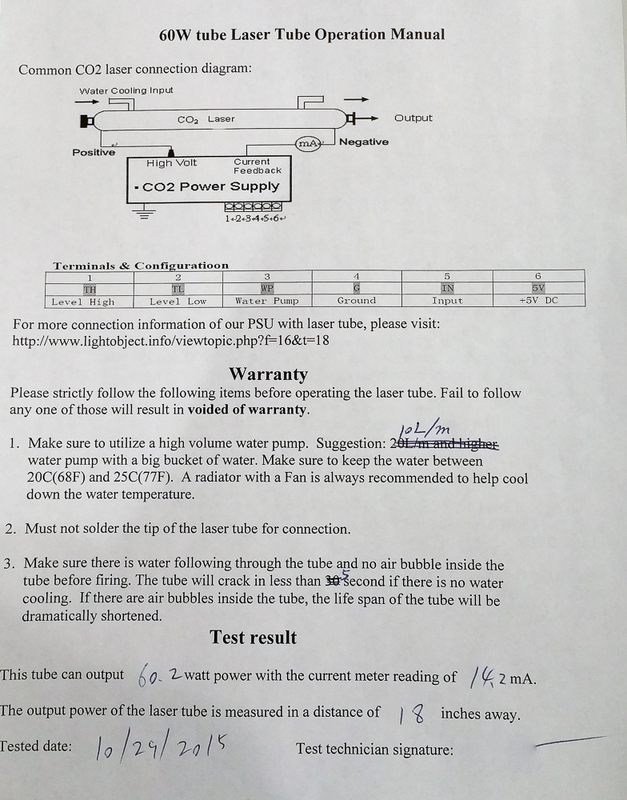 Upon testing my CO2 laser tube, I noticed very strange behavior. At 100% power, I was only getting about 25 Watts of power, but at 80% I was getting closer to 50 Watts. Also above 85% machine was making a high pitched “screaming” noises. Later I learned to associate these “screams” with sudden drop in power. All of this was due to the fact that, I didn’t actually have a 50W CO2 tube, but rather a 35-40W one. It just couldn’t handle high current and would drop power. In the process I was also greatly shortening it’s life span. Normally CO2 tube in the 30-50Watt range should not be powered by anything above 20mA. So anything above 60% was overrdriving and quickly killing it. That was an excuse for me to finally get a real 60W laser tube upgrade as well as new quality Power Supply. I ordered both (SP tube and 60 Watt PSU) from LightObject, which is a reputable laser equipment re-seller from California. First thing that arrived with PSU. 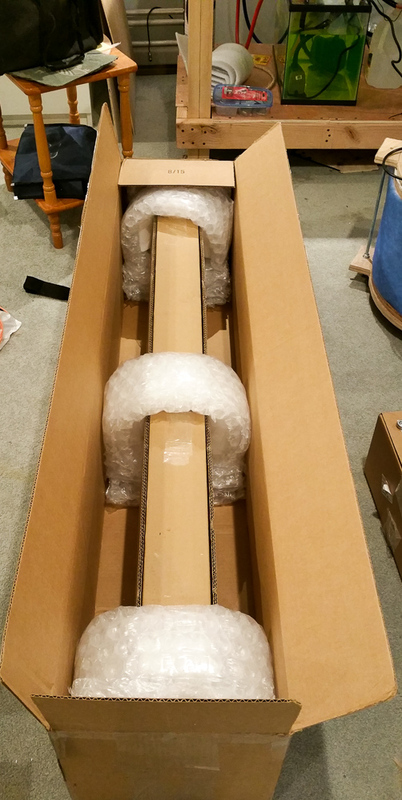 Few days later Fedex brought this really big and tall box to my doorstep. 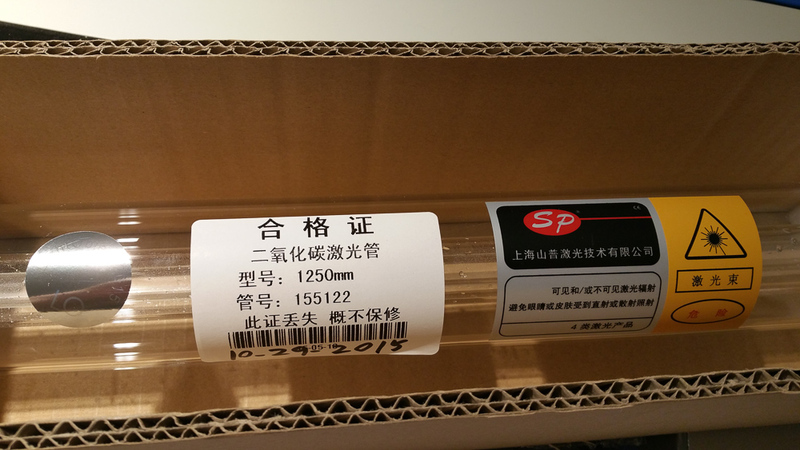 A beautiful 60W, 1250mm long CO2 laser tube. Some water droplets were sparkling inside. Tube was tested very recently. This nice piece of paper, had very interesting information about this specific CO2 tube. And here’s back of the power supply. All terminals are same as my old one, some just reversed. Which means I shouldn’t have problem with connections. Physically mounting it, would be a little challenge as this one is much bigger then the one that came with SH-G350.. In the following weeks I will be slowly preparing to install new components into my machine. There are few challenges that I need to overcome, such as building extension enclosure for a much longer CO2 tube (which will be protruding from side of the machine), getting all wiring done, and mounting tube inside. I don’t want to just re-use ghetto mounts supplied with machine (which are basically pieces of thick rubber pushed onto tube with some metal bends and bent machine screws). I was told about this awesome tube hangers, which I modified today to fit my 55mm thick CO2 tube, and already started to 3D print the parts. 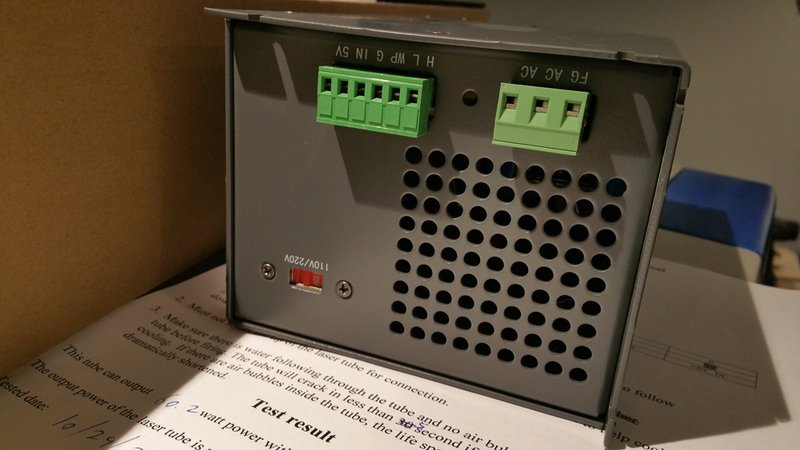 Another upgrade will be an analog Ammeter to monitor laser tube current. 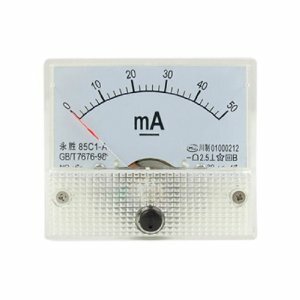 Are you interested in selling your power meter? Sorry I’m not selling mine 🙂 Why not just get one on Amazon? Oh, my. I have the same Shensui laser that I’ve enjoyed for the last year. Lacking sufficient instructions (and not speaking Chinese), the learning curve has been mostly trial and error. While I’ve done some pretty incredible things with this machine, I was frustrated at the cutting speed and power. Intuitively, if you want it to cut deeper, increase the setting. But as you appropriately found and shared, it was killing the tube. So, as a test I changed my most common project that was cutting 6mm acrylic with 4mm/sec at 85% power to 6mm/sec at 40% power. I was shocked! It cut much better (and faster). This comment is to acknowledge your investigation efforts and how it helped renew my spirit with this machine. Knowing that I really have a 35W (not a 50W) tube and how you explained why I was having the issues will help on many future projects. A true 60W tube will be in my future shortly (just as you’ve done). I have the same laser cutter and I had the same issue with the actual output dropping at higher settings (documented at http://www.rdworkslab.com/viewtopic.php?f=11&t=339) and get the highest output at 30-40%. A really good test of power is shown at https://youtu.be/WbBPps42iHc?t=7m53s where you cut into the edge of a piece of acrylic held up like a fence at different power settings and get a bar graph of actual cut depth. After using the 60W tube for a while how does it compare to the original tube?